In October, NASA discovered the universe was sliding inexplicably toward, well, something massive. They called the phenomenon "dark flow," and it's but one example of the creepy, unexplained awesomeness that awaits humanity in space. Like some kind of massive cosmic toilet bowl, the multitude of galaxies that populate the known Universe are swirling inexplicably toward a tiny 20-degree plane of deep space. At least, that's what astrophysicist Alexander Kashlinsky discovered in an incredibly controversial paper published in October 2008. Put simply for we laypeople, the paper suggests that way out in the cosmos—beyond Tatooine and idiotic Ewoks and Caprica Six's curves—lay a chunk of matter so beyond our understanding that it is actually pulling the observable universe toward it at 600km/s. But in that term "observable universe" lies the rub. We can't (and never will) "see" what this mass of theorised matter looks like. Which is too bad, because the dark flow theory hints that this mass, or super structure, could be anything from another universe to a realm of whimsical fancy whose physics, forces and warped space-time are completely beyond any of us. Unicorns, flying cars, cats and dogs living in harmony, you name it and it could be true, as we'll never, ever make it there to find out first hand. The WOW! Signal. Or, Holy Crap, Alien Avon Calling! Before Jodie Foster implored humanity to send poets to document the denizens of Vega, there was a real-life signal from the heavens that has, to date, remained one of the most compelling pieces of evidence that we are not alone. Called the WOW! signal, this 72-second beacon was detected by Dr. Jerry R. Ehman on August 15, 1977. 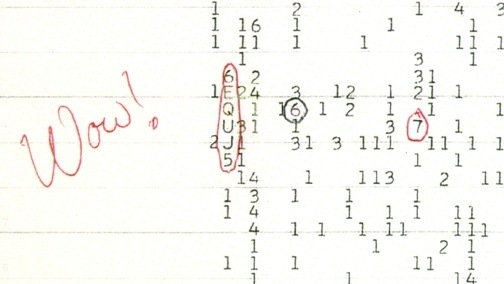 Because the unknown signal fit the parameters of what an artificial space signal might sound like so exactly, the awestruck Ehman jotted down "Wow!" when he first heard it. I'd also like to think he cartoonishly fell back in his chair and spit coffee out all over the terminal when it happened too, but that's just me. There is still another factor to consider. The signal could actually have been present for years (or millennia, for that matter) prior to its detection for the following reason. Just before the data acquisition and analysis (i.e., the "run") began, the declination of the telescope was changed. In the days (and years) previous to August 15, 1977 the radio telescope was not pointed at the declination where Wow! was seen; thus, we couldn't have detected that signal. I should note that during the Ohio Sky Survey many years earlier, we did survey the same declination we did when the Wow! signal was discovered. However, we were using a wideband receiver (8 MHz bandwidth). A narrowband signal averaged over a wide bandwidth would be reduced in intensity so much that it would have been buried in the noise. Thus, even if Wow! were present then, we wouldn't have seen it." So, was it aliens? 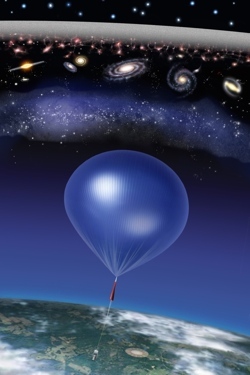 If we get off this rock and jet off into the stars, will we one day find the source of this mysterious signal? Who knows, as subsequent attempts made over the past 20 years to locate the Wow! signal, or another one like it, have failed. Even when more powerful systems were implemented, like the Hollywood-friendly Very Large Array in New Mexico, the results were all the same: Utter silence. If you'll allow yourself a bit of wishful thinking, however, the idea that this was some kind of powerful last-ditch burst of radiation from a dying alien race is not implausible. As detailed by author and astronomer David Darling, the Wow! signal could have been generated by an alien civilization with access to a transmitting dish like our Arecibo radio telescope. They'd also need a 2.2-gigawatt transmitter—extremely powerful, but plausible for humans (and definitely plausible if your race is, say, facing extinction). Contrary to what the original Alien movie poster might have lead you to believe, somewhere in the universe, something is screaming—and we can "hear" it. In the words of Alan Kogut from the Goddard Space Centre, "The universe really threw us a curve. Instead of the faint signal we hoped to find, here was this booming 'noise' six times louder than anyone had predicted." Of course, there is no sound in space. What NASA's ARCADE system received was actually deafening cosmic radio background, and the source is completely unknown at this time. Normally radio telescopes pick up electromagnetic chatter in the 10 MHz and 100 GHz, coming from what are known as "radio galaxies." But according to our existing models and theories, the signal shouldn't exist, as there are "not enough radio galaxies to account for the signal." As detailed by Jesus when this story initially broke earlier this year, NASA said that to create this signal, "you'd have to pack [radio galaxies]into the universe like sardines. There wouldn't be any space left between one galaxy and the next." That's obviously not the case. The discovery, while amazing, also carries with it a substantial negative. Remember all that cool stuff about dark flow and the edge of the universe from earlier? Well, the BOOM complicates our efforts to detect it more accurately. Stories like these confirm to me that we need to keep Hubble and similar programs going as long as humanly possible. 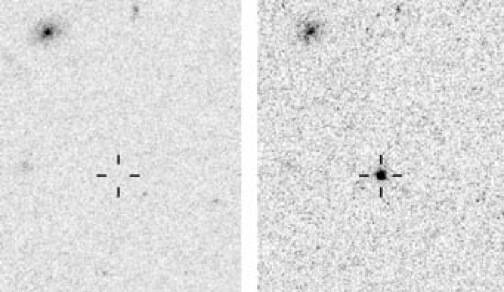 On February 21, 2006 (the paper was only published recently), the venerable space telescope spied a UFO in an area of space where there should have been nothing at all. Stranger still, the object disappeared almost as mysteriously as it arrived, about 100 days after the initial observation. It got very bright over time, to the 21st magnitude, then faded just as fast. Kind of like an explosion... Not much else is known about the celestial phenomenon, and it hasn't reappeared since 2006. The one other certainty? It wasn't dust, so there go all your jokes. 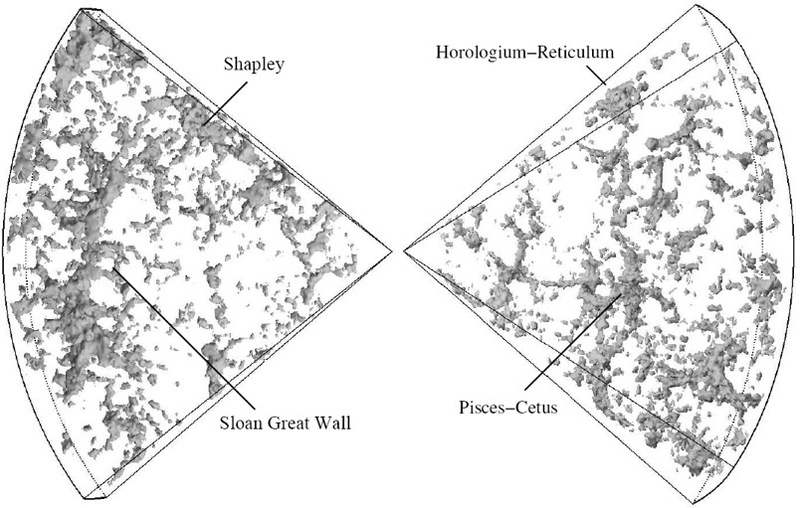 Until we figure out what that huge thing tugging on the pant leg of the universe is, the freakishly huge Sloan Great Wall is the largest structure known to mankind. It is a behemoth wall of galaxies, otherwise known as a galactic filament, that stretches 1.37 billion light years from end to end. The filament was discovered only recently, on October 20, 2003, by the Princeton University duo J. Richard Gott III and Mario Juri?. 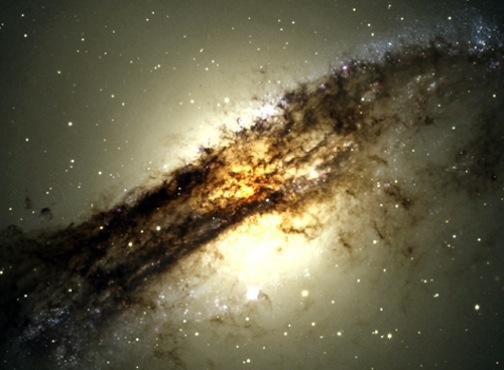 Its immense, unimaginable bulk lies an equally unimaginable one billion light years from Earth. It's kind of hard to wrap your mind around such distance, so we'll take things down an exponential notch or two and compare the Great Sloan Wall to something we might eventually (fingers crossed) map out in a few thousand years: The Milky Way. 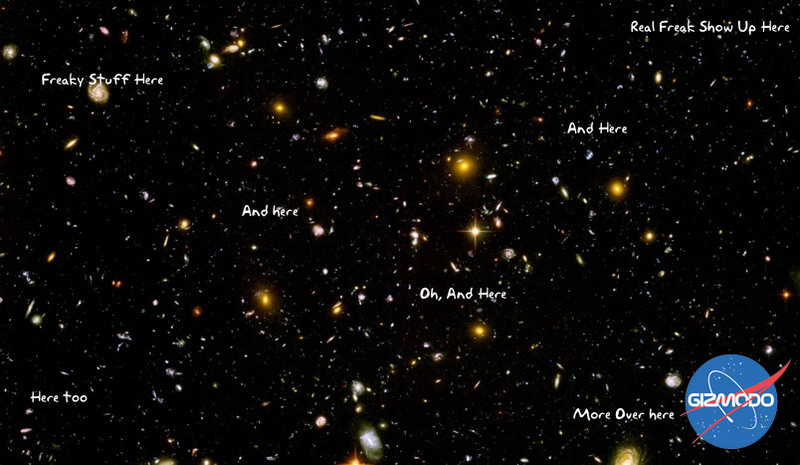 Our galaxy is actually considered large in the scheme of things. Various estimates say it's about 100,000 light-years from end-to-end, and about 1,000 light-years thick in the centre (where there lay a massive black hole). So, 1.37 billion versus 100,000. I'd say it's like David and Goliath, but that'd be woefully inaccurate. This Goliath would be incapable of even knowing about our insignificant little existence. Our "large" galaxy is more like a cell in the human body in this case—dutifully performing its mundane, insignificant work while the host moves obliviously on through eternity. To Boldly Go Where No One Has Gone Before. Or, My Closing. Now, admittedly, these interstellar objects and phenomena are a bit beyond both our reach and our comprehension, and I highly doubt we'll ever encounter any of them firsthand on our wild journey Off This Rock anytime soon. But you'll never hear me say "never" when it comes to space travel, even if you just did. This list, if anything, is a heads-up for us all as we (or our robots) journey into deep space. Watch your arse out in the ether, people, because it's a frakking freak show up there.